Providence is an urban masterpiece whose renaissance has been decades in the works and, arguably, is now complete. Return visitors from just two decades past would hardly recognize the core of downtown, where a river walk, upscale shopping mall, and new hotels and office towers have taken the place of a neglected and polluted waterway, parking lots and grubby rail lines. Downcity, the historic downtown, has seen a remarkable revival of its own, and despite several false starts, now boasts a lively mix of ethnic restaurants, live music and theater venues, and unique boutique retailers. Providence was founded by exiled preacher and pioneer of religious freedom Roger Williams, and was known from its earliest days as a haven for scoundrels and free thinkers alike. The city prospered from its maritime trade, commanding the head of Narragansett Bay, including the infamous slaves-for-rum Triangle Trade. Later riches accrued from jewelry manufacturing, banking and insurance. Today, the city is better known as home to the Ivy League's Brown University, the Rhode Island School of Design (RISD) and Johnson & Wales University. The latter's College of Culinary Arts — along with the homegrown talents of the city's large Italian, Portuguese and Latino communities — has made Providence a mecca for gourmets. In terms of accommodations, the Hotel Providence in Downcity's Arts and Entertainment District is conveniently located for on-foot excursions. Guests will feel equally cozy (and oh-so 19th-century) at the Old Court Bed and Breakfast, located just three minutes' walking distance from downtown on charming Benefit Street, which is lined with Colonial and Victorian homes. Rooms are decorated with period-style furnishings at this exquisite Italianate former rectory, which is very popular with visiting Brown families and faculty. For a bed closer to the heart of Providence's culinary action, the Hotel Dolce Villa is located on Federal Hill's historic DePasquale Square, with fourteen suites literally steps away from the popular Caffe Dolce Vita, which defines full-service by serving breakfast, brunch, lunch, dinner, and late-night snacks, desserts and drinks. 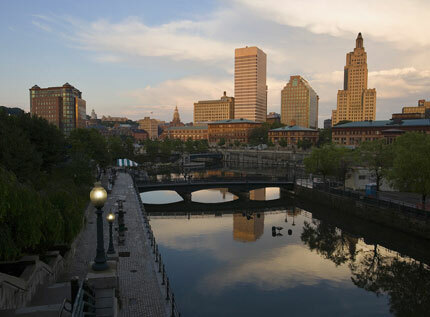 The city's best corporate hotel, The Westin Providence, is linked by sky-bridge to the Rhode Island Convention Center and the Providence Place Mall; it has a bit of a corporate vibe without being too sterile. Next door, the classic Providence Biltmore is an elegant alternative, while the Renaissance Providence — located between the Providence Place Mall and the state Capitol — offers hip accommodations within the shell of a historic, 1929 Masonic Temple. The Hilton Providence is next to the Providence Civic Center and the Dunkin' Donuts Center arena. There is also a Courtyard by Marriott just across the street from the Providence Riverwalk and a Hampton Inn on Weybosset Street in Downcity for more budget-friendly options. For Atlantic Ocean views and a sense of privacy in Newport, The Chanler at Cliff Walk offers offers twenty luxe rooms with Frette linens, fireplaces, king-size canopy beds and butler-drawn baths. It sits on a historic mansion-lined cliff walk overlooking Second Beach on Bellevue Avenue. The stylish NYLO hotel in Warwick, extensively renovated following Rhode Island's catastrophic flooding in 2010, is convenient to T.F. Green Airport and is one of the coolest places to stay, dine and party in Rhode Island, notwithstanding its location across the street from the state's largest shopping mall. Housed in an old mill building, NYLO is an intriguing island of redbrick charm, minimalist design and urban aesthetic in the heart of suburbia. Spend today exploring the Downcity district and Federal Hill, Providence's historic Italian enclave that's home to some of the city's best restaurants. Opening at 7:30 a.m., the Scialo Bros. Bakery on Atwells Avenue will help you greet the morning with a selection of biscotti and other Italian pastries along with a free cup of coffee, just as it has for bleary-eyed locals every day since 1916. Kennedy Plaza, home to Providence's outdoor skating rink and transportation hub, may be the heart of the city, but the centerpiece of the downtown revival is nearby Waterplace Park. A decade ago, city planners began transforming a barren landscape of parking lots, railroad tracks and debris-strewn rivers into an elegant urban park, complete with arched bridges, waterside walkways and a central basin with a performance amphitheater. Stretching from the upscale Providence Place Mall to the mouth of Narragansett Bay, Waterplace Park is a stroller's paradise almost any time of year; a pair of authentic Venetian gondolas offer those less inclined to hoof it a unique tour of downtown. The park and Providence Riverwalk continue to expand, with planners going so far as to move a section of I-195 out into Narragansett Bay and build a new bridge over the mouth of the Providence River in order to reconnect downtown with its historic waterfront. The new Providence River Pedestrian Bridge is now a beacon for those ambling towards Narragansett Bay. On select evenings, the rivers of Waterplace Park literally light up for WaterFire, an inspired bit of outdoor art in which floating braziers full of hardwood are lit to the accompaniment of haunting music amid a festival atmosphere. After a morning riverside stroll, meander into the Downcity core of Providence. If you love urban architecture, the historic neighborhood is definitely worth a tour. The city's former (and revitalized) retail core is full of Colonial, Federal, Greek Revival and Victorian structures; Providence is said to have a larger percentage of its buildings on the National Historic Register than any city in the United States. Some of the worthwhile stops include the 1913 Turk's Head Building, adorned with a granite relief of a ship's figurehead on its rounded prow; and the Shepard Company Building on Westminster Street, formerly the heart of Providence's retail district. Long neglected, Downcity has recently regained its place as the cultural heart of the city. Historic office buildings have been converted into condominiums and apartments, sparking the return of street-level retail stores and eateries. Local 121, situated in a onetime hotel for traveling salesmen, is an acclaimed purveyor of super-fresh and locally sourced cuisine. Gracie's is a local legend for innovative fine dining in a gorgeous setting. Long-vacant Downcity storefronts are filling with shops catering to the city's new urban residents: the Eno wine shop, Farmstead for exotic cheeses, and the housewares and décor at Homestyle — all on Westminster Street — are especially worth a visit. Modern Love, Queen of Hearts and Wharf Clothing and Wares will get you dressed from head to toe in the latest fashions. As night falls, Providence's art scene comes to life: to immerse yourself in the local vibe, drop into the oddball Red Fez for comfort food or catch a local band or poetry slam at AS220. The theater at the Trinity Repertory Company is one of the nation's most acclaimed regional playhouses, offering a variety of productions on two stages, including works by local playwrights and classics such as Our Town and Cyrano de Bergerac. National tours of Broadway plays like Mamma Mia and The Lion King always schedule a stint at the historic Providence Performing Arts Center, a gilded jewel in the crown of Downcity. For live music by major touring acts, check out the schedule at Lupo's Heartbreak Hotel, located in the former Strand Theater building, or the Dunkin' Donuts Center. Cap your evening with dessert at Pastiche or Caffe Dolce Vita on Federal Hill, or the cozy L'Elizabeth on South Main Street before heading back to your hotel. *Images from Providence Warwick Convention & Visitors Bureau.